In an unprecedented turn of events, Sioux Lookout, in Ontario, Canada has rescinded the bag ban put into place in September 2010. A town bylaw implemented the ban on single use plastic bags which were not to be sold or given away within the town. The plan was structured with a 1 year phase-in period to allow residents to get use to an existence free of disposable bags. 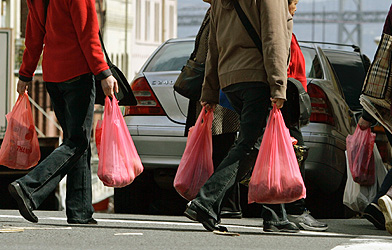 During the phase-in period warnings were issued to anyone violating the law, but after that period fines would be charged to those selling or giving away disposable plastic bags. The law had been passed by outgoing members of the Council before they left office. Unfortunately, the town never made it out of the phase-in period. After 4 months there was so much opposition from residents and business owners alike that the Council took a re-vote and pulled the plug on the initial ruling after the bylaw was voted down 5-1. Previous council members had good intentions. Their goal was to reduce the amount of plastic bags dumped into the town’s landfills, which are overflowing with non-biodegradable bags. Plastic bags have only been in existence for about 50 years, so no one is really sure how long it takes them to breakdown. Studies suggest it can take 99 years or longer. That is an awfully long time for plastic bags to just sit. The problem is not completely just that the bags are taking up space, but also that they can interfere with biodegradable waste from breaking down, to add insult to injury. In the case of Sioux Lookout the ban failed because it was rushed. The ban was voted in after months of deliberation and in this case that just was not enough time. There were too many outstanding issues that kept some residents and businesses from getting on board with the plan and ultimately that caused the downfall. What is even more noteworthy concerning the Sioux Lookout case is that a poll conducted prior to the ban indicated a majority of residents preferred reusable grocery bags to the disposable alternative. Despite this the ban just did not take. Other municipalities have successfully passed bans despite opposition, but they took the time necessary to iron out the details. There is no one-size-fits all approach to passing any type of law. What is necessary for one municipality may be excessive for another. In the cases of other cities and towns with bans they listened and responded to the opposition to fine-tune their law in order to set it up for success. An example of a success story is Leaf Rapids, Manitoba, Sioux Lookout’s northern neighbor. Leaf Rapids owns the distinction of being the first North American city to ban plastic disposable bags as of March 22, 2007. Leaf Rapids took a very unique approach to making plastic bags history in their town. The Council purchased reusable shopping bags from the Leaf Rapids Consumers Co-Operative store and received additional bags from donations. Local officials in turn donated 5 bags to every household in town under the condition that the residents use these bags when they shop. If they did not use the bags they would have to pay $0.03 for each disposable plastic bag used to pack their groceries. The program has been a tremendous success and officials from Leaf Rapids claim no one has violated the law, which calls for fines imposed against stores that hand out plastic bags. Today if someone forgets their reusable bags stores will pack their goods in paper bags, which residents are quick to recycle. Leaf Rapids had a unique advantage of being such a small town; when major cities and metropolitan areas, like San Francisco and Los Angeles County, passed bag bans the idea of local municipalities donating reusable bags to each and every household was just not an option. Leaf Rapids also had the good fortune of being on-board with the notion of a ban at the right time and they were able to secure outside help and donations to make the ban a success. Sioux Lookout on the other hand is not letting this setback stop them from moving forward. The mayor plans to work with the Council to step up recycling efforts in the city to help combat the plastic bag predicament. At this point in time there is no talk of revisiting the notion of a plastic bag ban. With any luck the residents of Sioux Lookout will hold the notoriety of being the only city to overturn their plastic bag ban, and hopefully in the meantime they continue to bring reusable grocery bags when they head to the store and increase their recycling efforts. For more information about Sioux Lookout’s ban check out http://www.chroniclejournal.com/content/news/local/2011/10/22/bag-ban-cancelled, http://www.tbnewswatch.com/news/170004/Sioux-Lookout-repeals-plastic-bag-ban, and http://thedrydenobserver.ca/2010/04/sioux-lookout-wants-to-ban-plastic-bags/. To learn more about Leaf Rapids’ ban go to http://www.townofleafrapids.ca/green_initiatives.htm#Banning Plastic Bags.